THE French pilot timed our ascent to perfection. As the hot air balloon lifted from the ground and 16 of us in the basket were finally upright, we came face-to-face with a most spectacular sunrise. 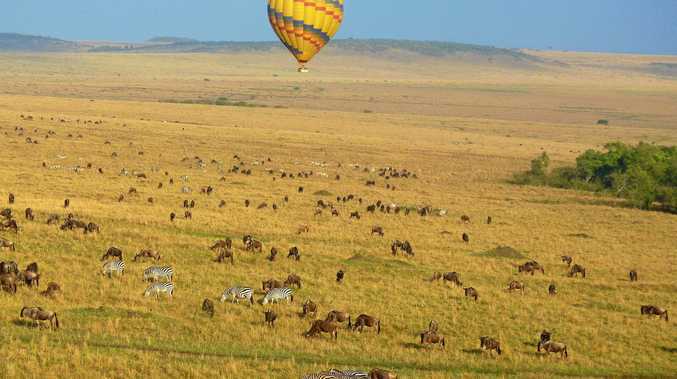 This was the fabulous start of a one-hour ride over the Masai Mara national park in Kenya. "This is paradise," crooned the pilot, Vincent, who came to Africa in 1969 and never returned to France. All around us was a panorama that excited the senses - herds of wildebeest and zebra on the green plains, an occasional lion, mongooses scurrying in the undergrowth, giraffe snacking on acacias. At times we were lowered to within a few metres of the ground. After a smooth landing and such a wondrous experience, we were transported to a champagne breakfast set up in a park clearing. Later in the day it was time to say hi to the "locals", the strikingly colourful Maasai warriors. These men are known to kill lions to complete their initiation. Rather than being in any way warrior-like, though, they politely danced for and chatted with the tourists. If we thought we were roughing it, our accommodation was luxury level compared with the Maasai huts. About the size of my husband's shed, one hut housed an entire family. Invited to go in, we peered through the darkness and could just make out the figure of a woman seated in the corner next to an open fire. She never said a word - the men seemed to do all the talking. A small slit in the mud and dung-smeared wall let in almost no light. The simple bed was bamboo-framed with a plastic sheet and cowhide where the Maasai slept. It's as if they have no desire for unnecessary frippery in their furnishings. Their bodily adornments, in contrast, are ornamental and showy, especially during their dances. Every African I met was unfailingly helpful and polite. Security is plainly a growth industry in this nation which has seen tourism numbers plummet after well-publicised terrorist attacks. Guards with guns are a common sight at the entrance to hotels and shops, particularly in the capital, Nairobi. Much of the trouble seems to come across the northern border so it's better to steer clear of that region. I'll no doubt savour memories of East Africa for years to come ... being headbutted by a giraffe, coming close enough to a gorilla to be able to touch it, watching orphaned baby elephants frolic in the mud, visiting a pygmy village, kayaking to the source of the Nile with a glass of gin and tonic in hand, teaching Ugandan schoolchildren how to dance the hokey pokey, and admiring a cheetah and her four cubs, among many. This elegant mamma had done well to rear so many cubs with ravenous packs of hyenas on patrol in the Serengeti. On one safari, we came across three lionesses with nine cubs. The driver of the safari vehicle in front of us mimicked the call of a lioness, and the young ones bounded towards us. They surrounded the vehicles, providing a true close-up encounter. After the lions had passed by, a herd of elephants crossed our path. Yet another "wow" moment. My fascination with African wildlife will never end. Each game drive, no matter how many you take, is witness to a plethora of animals in different settings. Mighty rivers and plains, splendid views, warm-hearted people and an adventure that never ends ... that's what draws us to East Africa.